After defeating the Redbirds in a nail biting game that had the entire stadium cheering to the very last second of the game, Big Train will host the Aces for a doubleheader at Shirley Povich. 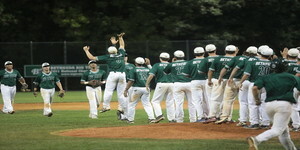 With the win last night, Big Train now has a record of 25 wins and 4 losses, and they are currently on a win streak of 5. The Aces have a record of 11 wins and 15 losses, and are ranked fourth in the Cal Ripken Southern league, while Big Train remains in first in the Southern league. In 3 previous match-ups, Big Train leads in wins against the Aces, with Big Train winning 2 of the games and the Aces winning 1 game. Big Train looks to extend this streak today. Some standout players for the Aces include: Kris Kremer, who leads the team with 14 RBI, 4 homeruns, and a batting average of 0.284; Nate Mallot, who leads the team with a batting average of 0.333 and 1 RBI; Scott Morgan, who has 9 RBI and a batting average of 0.273; and Reid Powers, who has 9 RBI, 1 homerun, and a batting average of 0.235. First pitch for the first game of the doubleheader is scheduled for 4 p.m. and gates open at 2:30. First pitch of the second game of the doubleheader is scheduled for 7 p.m.